Following the release of the IPCC report, organizations and individuals have shared pressing messages on the individual’s role in climate change. Chicago Bulls player and environment enthusiast Lauri Markkanen is now taking a fresh approach to the matter. 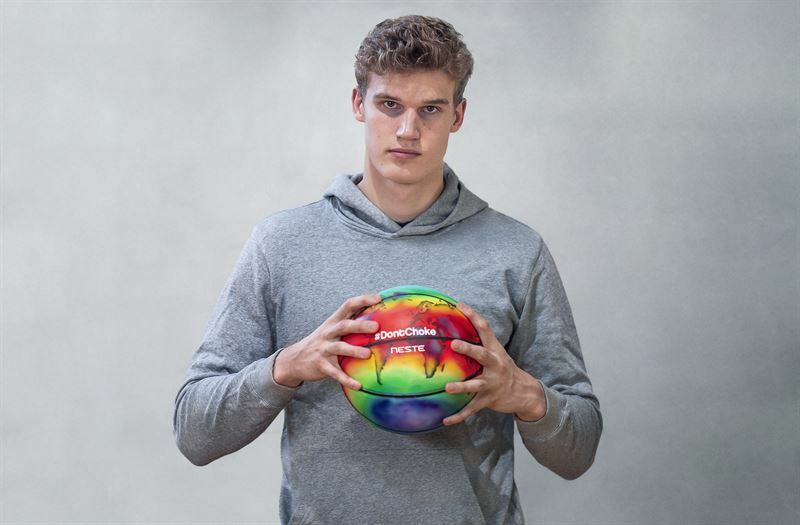 A collaboration between Markkanen and the Finnish renewables company Neste will have Markkanen shooting hoops with this year’s world heat map. The surface of this basketball is covered with a hand-painted visualization of the world’s record-high temperatures from last summer. Pictures of the blazing planet went viral in the summer, as heat waves broke records around the world. 2018 is projected to become one of the hottest years on record. With temperatures soaring, this project is an urgent call to action. “I have been lucky to spend my childhood in Finland, where I was able to enjoy the four seasons of the year. After becoming a father, protecting our planet and combating climate change has become a priority to me. I want to do everything in my power so that my child will grow up in a clean environment, like I did. This is a call to all my fans to do their share”, Markkanen explains. The collaboration is part of Markkanen’s #DontChoke campaign with Neste, which is a call to action for individuals to do their share in battling climate change. To effectively protect the climate, each action, no matter how small, is important. “As the latest IPCC report shows, the time to act is now. Our collaboration is set out to challenge people to make responsible choices every day by transforming their mindset. #DontChoke communicates that we shouldn’t choke in front of big challenges, whether they face us on the court, or off it. Instead, we have to be courageous and goal-oriented to make better, sustainable choices”, Neste’s Marketing Director Sirpa Tuomi continues. Lauri Markkanen is a Finnish professional basketball player for the Chicago Bulls of the National Basketball Association. With roots in the untouched nature of central Finland, Lauri has risen from a unique environment to celebrity status, and discovered a platform to make a difference. Known for his achievements on the court, he is also set to become a forerunner in raising awareness for environmental issues.